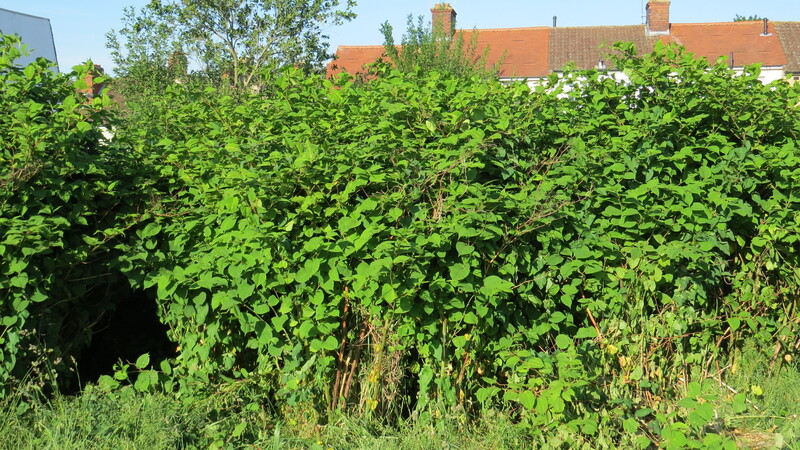 Dear Readers, a few weeks ago I was alerted to the presence of Japanese Knotweed growing beside the playing fields which border Coldfall Wood. A worried person had reported the plant to Haringey Council, because he was concerned that it would spread into the wood itself. It was reported that children were using its stems as swords, and that ‘Japanese’ ladies were taking cuttings. Naturally, I had to see this botanical phenomenon for myself. Once I’d found it, I could not believe that I’d missed it. There are two stands of the plant, one bordering the cemetery, the other close to some houses on the other side of the playing fields. Each stand is about three metres tall, but what amazes me is how dense it is – the bamboo-like stems erupt within centimetres of one another, forming something that resembles a panda’s breakfast. Nothing can grow where Japanese Knotweed grows, I’m sure. 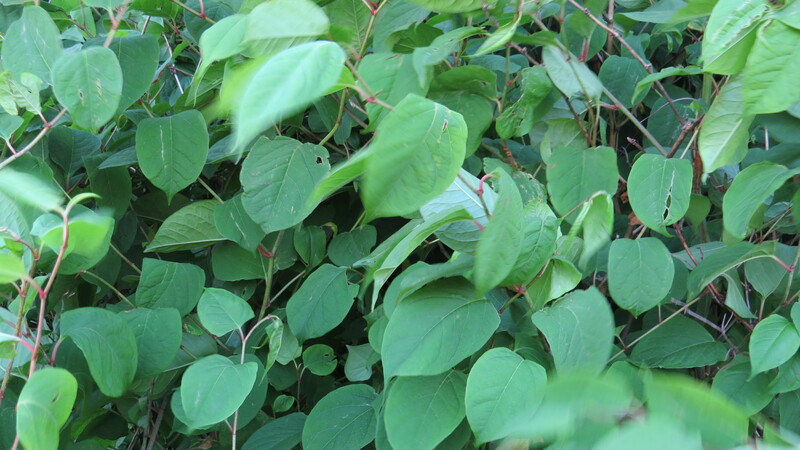 How can you identify Japanese Knotweed? Its leaves are described as ‘shield-shaped with a flat base’. The stem is hollow, and flecked purple-red. Older stems become very clearly striped, which perhaps accounts for its name in Chinese Medicine (Huzhang – Tiger Stick). It flowers in late summer, and has tiny spikes of white flowers. These are the female flowers – male flowers are unknown in the UK. This does not stop the plant from spreading, however, as we shall see. 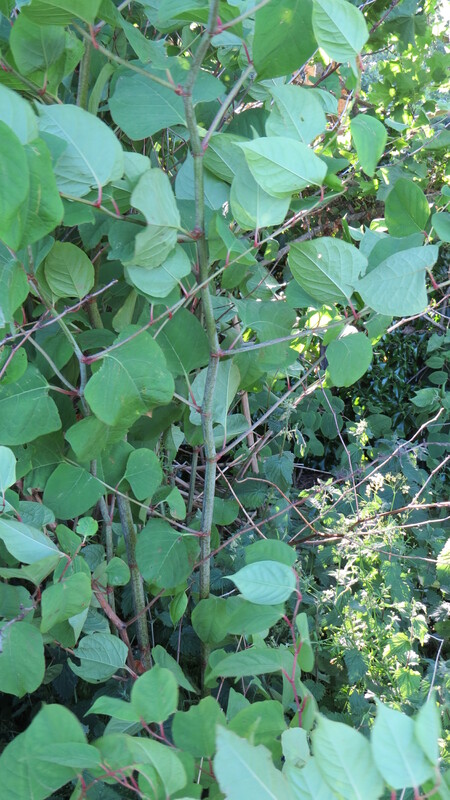 The most distinctive feature of Japanese Knotweed, however, is its rhizome, which is a kind of root which sends out new stems and stalks. If you dig some up, it looks a little like ginger, but the inside is orange, and it is said to snap like a carrot. 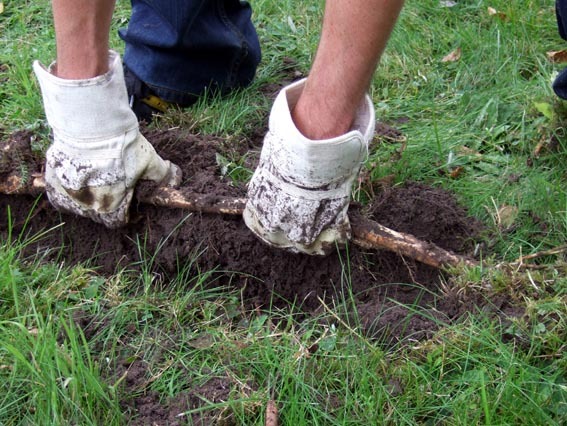 It is this rhizome which enables the plant to form thickets, and which means that it is so tenacious – it can regenerate from any tiny piece which is left behind. 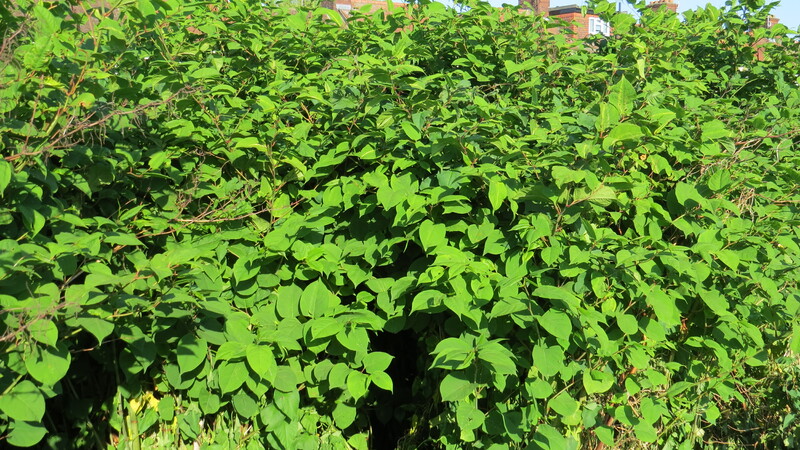 By the way, I suspect that trying to get rid of a well-established plot of Japanese Knotweed by yourself would be back-breaking and probably ineffective, plus the remains of the plant are classified as ‘Controlled Waste’, which requires disposal at registered Landfill sites. The normal way to get rid of Japanese Knotweed involves a massive dose of herbicide, followed by lots and lots and lots of digging and sieving. However, there are alternatives. In Haida Gwaii, islands to the extreme north-west of Canada with a rare and beautiful flora, they have been experimenting with the application of sea-water to the plant, which is said to be showing promising results. Here in the UK, a Japanese aphid (Aphalora itadori) which preys specifically on Japanese Knotweed was released back in 2010. It seems to be establishing itself well, and although I am nervous about ‘fighting fire with fire’ in this way, so far there seem to have been no detrimental side-effects. 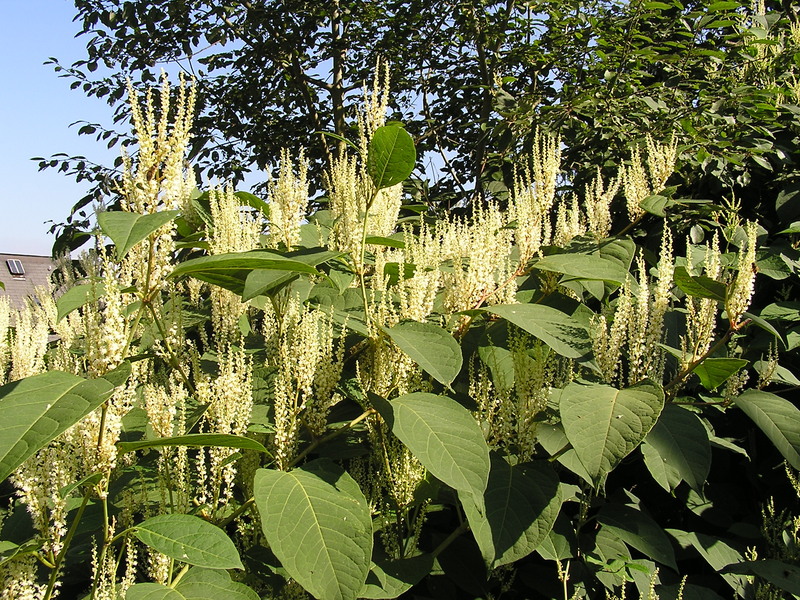 Japanese Knotweed is not new to the UK – it was first introduced in 1825 as a garden plant, and was first recorded in the wild in 1886. As I turn to my trusty Flora Britannica by Richard Mabey, I discover that it was a great favourite with Victorian gardeners, although they tended to plant it in their plantations and by their streams as it was too vigorous for any smaller space. Alas, it was a plant with ambition, and by 1900 was growing wild in London. By the 1960’s it was everywhere, from Lands End to the northern tip of the Isle of Lewis. In Cornwall it is known as ‘Hancock’s Curse’ because it was originally planted in the garden of a Mr Hancock. Everywhere it is discovered it seems to generate a frisson of alarm, much as if John Wyndham’s Triffids had turned up. 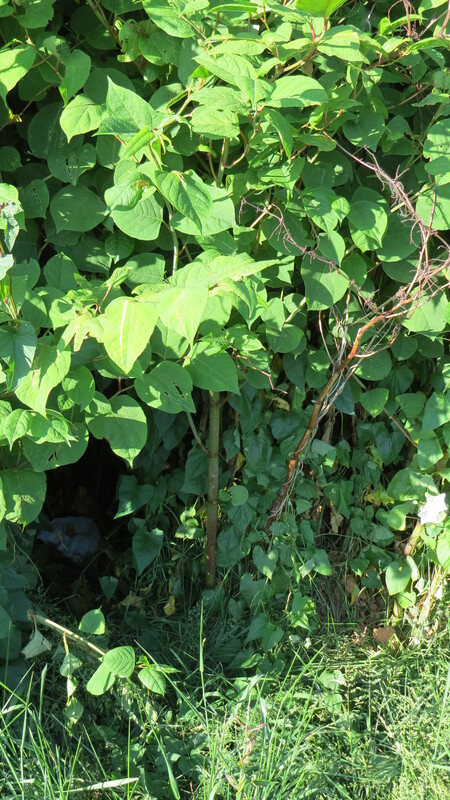 And yet, like all plants, Japanese Knotweed is not an unalloyed monster, just a plant that has found itself in a habitat that is to its liking, and which is taking advantage of the fact. 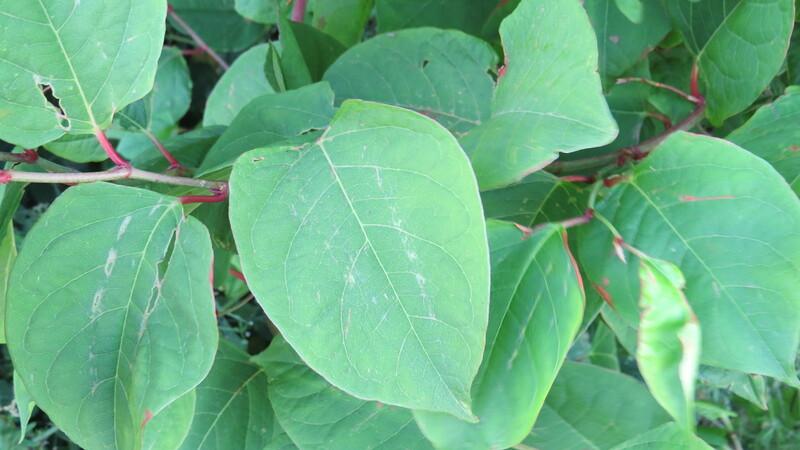 It should not be forgotten that Japanese Knotweed is also a valuable plant for pollinators, and is useful for beekeepers because it flowers late into the year, when many other plants have past their prime. The honey is said to taste like a mild form of Buckwheat honey, which is not surprising as Buckwheat is another member of the family that includes the Japanese Knotweed. In Chinese traditional medicine. the plant is used for treating some heart conditions, as a laxative (let’s not forget that it is a cousin to rhubarb), and as a tonic. Some research has shown that it may be useful in treating Alzheimer’s disease, and it is a useful source of vitamins A and D. Like rhubarb, it also contains a lot of oxalic acid, which can aggravate rheumatism and kidney stones, so it should be used with discretion. 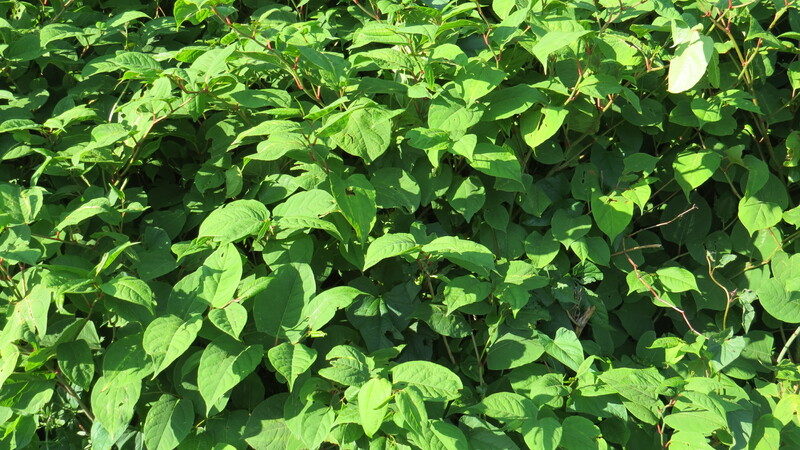 So Japanese Knotweed, like any plant, is not a thug without any redeeming features. In its original habitat, I suspect that it was a graceful, useful plant, and maybe it could be here, too.Few organisms are entirely heroes or villains, and it is often our lack of knowledge that makes us consider them so. There is no substitute for a little research, and for taking a deep breath before demonising anything, plant or animal. This entry was posted in Uncategorized on June 20, 2015 by Bug Woman. Good point, Ann. You never know when the council have been in with the RoundUp, or worse….